The Indexer knows as well my macros and grays out things if not active or disabled. But sometimes things simply look wrong: I know that my macro is enabled, but the editor still shows it grayed out? Wrong Indexer? Macro block grayed out…..
I’m sure that I have defined PL_HAS_TEMPERATURE in my header file, and I properly have included it. Still eclipse thinks it is not defined or not set to one? This usually fixes things for me. What I have found out is that ‘Allow heuristic resolution of includes‘ is causing inaccurate results. As in my example above,the indexer is not correctly using the includes if heuristics are enabled. The solutions is to disable heuristics. The other setting is for the active build configuration: I make sure I have ‘Use active build configuration‘ enabled. That way the Indexer is switching the data base based on the build configuration too. 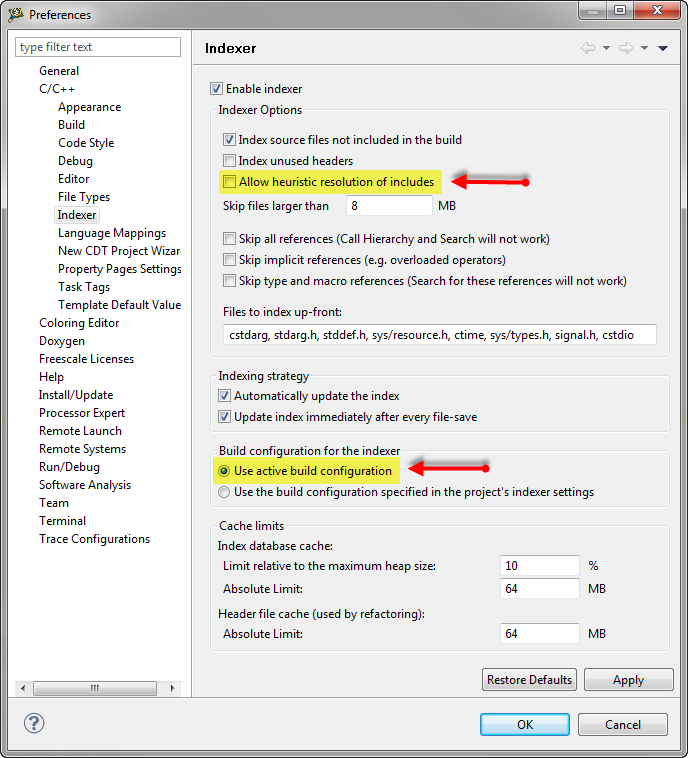 This entry was posted in Eclipse, Tips & Tricks and tagged Building, CodeWarrior, Eclipse, Tips&Tricks by Erich Styger. Bookmark the permalink. Nice, that didn’t solve my problem but it pointed me in the right direction. I was seeing a lot of my symbols not showing up as being indexed. Some of my class types would be green and some would stay black. Increase the Cache Limits in the same window as listed in the article. We have a rather large C++ project that was exceeding the cache limit. Dude, how can I thank you more!! The solution actually worked for an issue that had been in the back of my head bothering me all the time! Thank you for taking the time to post, you have solved an issue i have had for 8 years! Turning of “Allow heuristic resolution of includes” fixes my issues with greyed out #ifdef areas which has being a constant point of stress with this IDE. > The other setting is for the active build configuration: I make sure I have ‘Use active build configuration‘ enabled. Yes, I believe I have seen a bug report about this. I have not checked it in Eclipse Luna, but the hope is that it is fixed there. OK – thanks. I’m still on Kepler SR2 but will try Luna when I get a chance. More generally I’m having problems getting imported epf file settings taking effect. I presume that no editing of the exported epf file (e.g. to remove the leading “/instance”) is needed unlike when putting the settings into, say, plugin_customization.ini? Also (and maybe this is already well known) it seems pretty hit and miss which settings exported to an epf file can be edited and then applied via plugin_customization.ini and which seem to be ignored. E.g. I’d like to set a PATH env var but org.eclipse.cdt.core/environment/workspace/PATH/value= in plugin_customization.ini doesn’t take effect for some reason. Similarly I’d like to override and disable the GNU ARM Eclipse OpenOCD debug pre run reset setting but ilg.gnuarmeclipse.debug.gdbjtag.openocd/gdb.openocd.doPreRunReset=false in plugin_customization.ini doesn’t take effect. Any advice/suggested reading as it seems difficult to find authoritative and comprehensive info about this stuff. Thanks a lot! It was really driving me crazy to edit active code in grayed area where no suggestion was available. This solved it. Glad to hear that you have found the solution, this one has bogged me for a long time too. Eclipse has got a bad reputation and quite frankly, with such problems, it deserves it. Yet it’s also very close to being very good indeed. Yes, these small things indeed are very painful. The good thing is knowing these small fixes, with everyone else in the industry using Eclipse: that knowledge can be applied to all these different tool vendor IDE’s based on Eclipse. It is a shame that somehow the Eclipse developer community is paying so little attention to all these small (but important) things.